New York State's first Certified Passive House sets the benchmark for energy efficiency. For Dennis Wedlick, the conservation-minded architect who masterminded the Hudson Passive Project—New York State’s first certified passive house—passive building is nothing short of revolutionary. Based on design models established by Germany’s Passivhaus Institut, passive dwellings basically heat and cool themselves, often slashing typical heating bills by upwards of 90%. Although more than 30,000 of these ‘zero-energy’ buildings have been erected in countries like Austria and Germany, passive houses remain rare in the United States, says Wedlick, whose residence in Claverack, New York, is one of only 11 U.S. projects to be awarded certification from the Passive House Institute, the American arm of Passivhaus Institut. 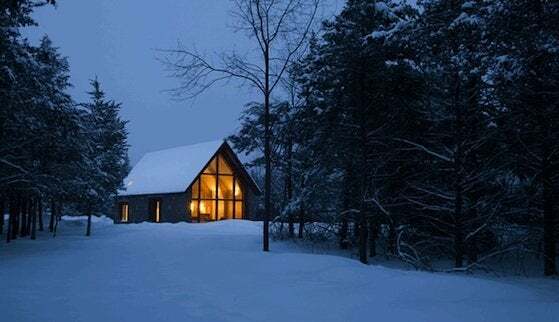 Not to be confused with passive solar, which requires architects to calibrate their designs to maximize solar energy, passive houses focus on minimizing the amount of energy used to heat, cool, and operate a dwelling. Unlike more traditional green residential designs, which often rely on technologies like solar panels and wind turbines, passive houses come close to achieving near-zero energy consumption by being super-insulated and airtight. 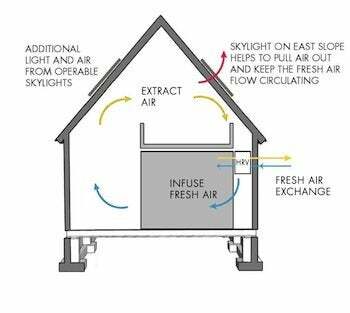 To achieve this, builders insulate the entire envelope, including the walls, roof, even the foundation, and meticulously caulk, seal, and tape every possible gap or opening in the house so that the structure is so airtight it could literally hold water. Although Wedlick spent several years refining the eco-specifications of his design using thermal modeling and precise climatic information provided by Passivhaus Institut, the Hudson Passive Project took only about six months to construct once actual building got underway. Wedlick received grant money from the New York State Energy Research Development Authority, and tapped Chatham, New York, custom builder Bill Stratton to oversee construction. Although high performance and energy efficiency motivated the project, Wedlick was equally attentive to the look and feel of the three-bedroom, two-bath home. With its exterior stonework, timber frame, and pitched roof, the house, which is situated on seven acres in the Hudson River Valley, pays tribute to the Dutch barns that were once common in the region. “The aesthetics of the structure have a lot to do with the message of the house,” says Wedlick, who wanted the residence to have a strong connection to nature and give the impression that the house is as healthy indoors as out. To this end, Wedlick opted for a striking two-story wall of triple-paned windows on the structure’s southern exposure as well as soaring, cathedral-like ceilings with bow-arch beams, which give the open, loft-like interior a roominess that belies its compact 1,650 footprint. When it came time to outfit the interior, Wedlick cleverly proved that energy efficiency and luxury aren’t mutually exclusive. He relied on eco-friendly lines from companies such as Baldwin Hardware and Waterworks, focusing on products made to last (yet another important measure of sustainability). In the kitchen, Wedlick installed beechwood cabinets, marble countertops, and premium, energy-efficient GE appliances suited for a passive house. “We wanted to reduce penetration and the number of openings we’d need to make airtight, so we opted for an induction range with no hood,” notes Wedlick. Any exhaust fumes get funneled through the ventilation system. The bathrooms, which feature low-flow Waterworks faucets and fixtures, are outfitted in marble and recycled glass tiles. For increased energy efficiency, the bathrooms and kitchen were ganged together, back-to-back, in order to share the hot water provided by the home’s single on-demand water heater. Situated on the north end of the ground floor, the master bedroom features sliding barn doors that can be pulled shut for privacy. Tucked under the eaves on the second level, two bedrooms and a study occupy the open loft; skylight windows let in sunlight and provide a sense of spaciousness. For more images of the project, check out our House Tour slideshow. For additional information on the standards and techniques used to build passive houses, visit Passive House Institute US. To learn more about the Hudson Passive Project, click here.